And that’s it! But in case you want to know more about each step, please continue reading. Creation of every campaign starts by specifying the campaign description. Start by clicking on the “New campaign” -button in your campaigns tab and fill in the requested campaign description information. Don’t forget to save. Try to accurately describe your campaign goals and give the Content Creators a good understanding of your wishes. The campaign description allows you to communicate the same for all Creators you will be contacting, later on, individual messages can be sent out with specific tasks and offers. After creating the campaign description you click on “Invite creators” to land on the Content Creators search page where you will see a wide variety of Content Creators with different specializations to choose from. Use the filters on the left-hand side panel to filter out the Content Creators you would like to approach. Add them to your campaign shortlist by clicking on the pin icon in the Content Creators card. 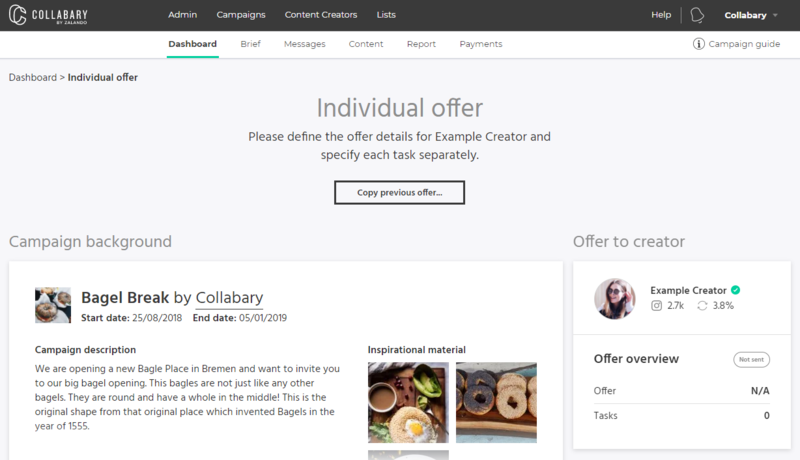 After you’ve added a Content Creator to your campaign shortlist you can start preparing their individual offer by clicking “Specify offer” on the “Shortlisted” -section on your Campaign Dashboard page. In the individual offer you can decide on the budget you want to extend to the Content Creator, and the required tasks such as posts or stories to perform in the campaign. After the Content Creator accepts your proposal, it will become a legally binding contract. After sending out an offer to a Content Creator you can chat with the creator in the on-platform messenger to clarify any campaign details. In case you’re unsure what to offer to the Content Creator, you can use the “Request quote” -option for the offer type to ask the Content Creator to provide a quote for participating in the campaign. You will be able to view & approve the produced content under the “Content” -tab in the campaign menu beforehand. 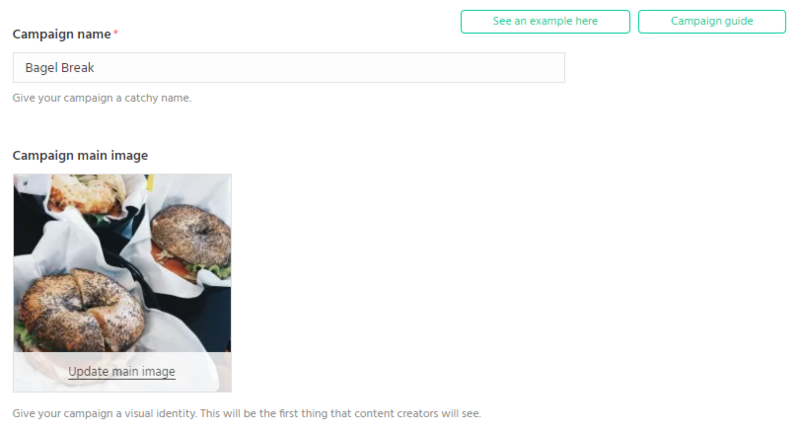 After a Content Creator has completed all tasks agreed upon the link to their post, video or blog will be uploaded to the Collabary platform as well as the high resolution images and analytics. The reporting function in the toolbar allows you to see progress throughout the campaign’s entirety and results after it is finished. On this page, you will find a summary of the campaign’s basics as well as specific analytics on each specific posting and content creator involved in the campaign. Tip: it is possible to download these analytics as a report or as a powerpoint presentation. As a brand you will receive only one invoice from Collabary for all the Content Creator payments in your campaign. We will take care of the rest!